MEMBERS OF A Kildare band have been hailed as heroes after saving more than a dozen people, including a baby and three children, from a house fire in the US. Dissension Rising woke up to the sound of a smoke alarm while staying at a friend’s house while on tour in Atlantic City, New Jersey. The band then woke up their four friends and they all escaped out to the street where they then heard screams coming from a basement apartment – where a family were trying to escape. The four musicians, aged 17 to 21, and their manager and driver immediately began to help get the family out. According to local media in Atlantic City, it took 27 firefighters to bring the fire under control. 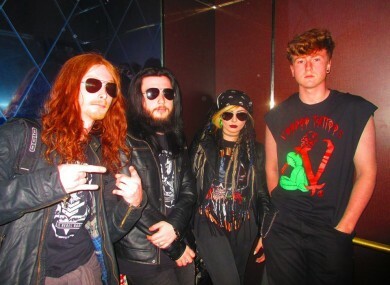 Singer Danni Carroll (18), lead guitarist Keith Garrett (21), drummer Kian Johnston (17), rhythm guitarist Rob Higgins (20), manager Dorothea Carroll (57) and driver Justin Carroll (42) have all been widely praised for their actions. The vicious fire caused significant damage to the house but there were no reported injuries. If Dissension Rising hadn’t spent the night at Dane’s house, my son would be dead today. They saved everyone in that house. I will always be indebted to this band. God bless you guys. It’s believed that the blaze was an electrical fire that started on the first floor. Email “Irish band rescue family, including a baby and three children, from US house fire”. Feedback on “Irish band rescue family, including a baby and three children, from US house fire”.